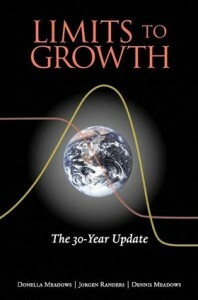 “Limits to Growth” turns 40! In 1972 a group of MIT scientists wrote The Limits to Growth. Using sophisticated computer modeling, the authors — Donella Meadows, Jorgen Randers, Dennis Meadows and William W. Behrens III — showed the consequences of unchecked growth on a finite planet. The book, which became an international best-seller, shocked the world and generate a mixture of praise, criticism and skepticism. I encourage you to pause for even a few moments today to listen in. Then sit down at dinner tonight with your friends or family. Ask this question: how can we prosper on a on a finite planet? What might that look like?